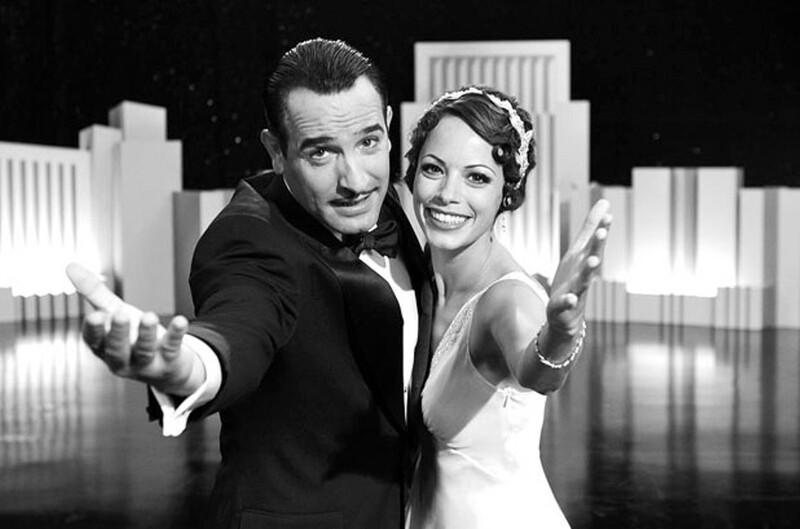 THE SILENT TREATMENT Dujardin and Bejo play stars on opposite trajectories in this love letter to old Hollywood. I’m not sure French writer-director Michel Hazanavicius’ love letter to the cinema is, in fact, the most outstanding movie of last year, as many maintain. But who would deny that it stands out from the motion-picture pack? A black-and-white, mostly silent film set in the 1920s and early ’30s and starring people most Americans have never heard of? Not exactly the formula for box-office success. And yet The Artist is indisputably winning. Wear your good undies, because it’s going to charm your pants off. A charming film is not necessarily the same thing as a great film, of course. This one has its flaws, but it also has supercharged charm to spare. Jean Dujardin is charming in the role of George Valentin, a swashbuckling megastar of the silent screen. Early on, he has a chance encounter with a fan played by Bérénice Bejo (Mrs. Hazanavicius in real life) and — you guessed it — is charmed by her. She’s an aspiring actress named Peppy Miller, and, yes, she is both peppy and charming. No sooner does Valentin use his influence to finagle her a small part in one of his pictures than talking films take the country by storm. If you’ve seen A Star Is Born, you can guess what happens next: As swiftly as Valentin’s star fades (I think he sets a new world record for becoming a has-been), Peppy’s ascends. Faster than you can say “Clara Bow,” she’s America’s new movie sweetheart. He moves out of one Hollywoodland mansion and she moves into another. Story is not the draw here. The filmmaker quotes from and pays tribute to so many classics, you don’t just feel as though you’ve seen this all play out before. You feel as though you’ve seen it countless times. The draws are the effervescence of the performances, the director’s infectious love of Hollywood and its history, and the occasional inventive flourish. My favorite was the dream sequence in which Valentin recoils in horror as the age of sound dawns. Suddenly the volume knob on his world has been turned up. A vase clinks when he places it on a tabletop. A clock ticks. His dog barks. But, try as he might, he can’t will a word out of his mouth. It’s a great touch. There’s a stretch toward the end that could have used more of that playful magic. Long after we’ve gotten the idea that the onetime matinee idol has hit rock bottom, Hazanavicius makes a curious miscalculation. He keeps finding new bottoms for Valentin to hit. As a result, things begin to drag, and the picture comes perilously close to running out of charm. Will Peppy come to the rescue? Will George make a comeback? Is true love in the cards? Anyone who’s ever seen a movie knows the answer to these questions before the opening credits even hit the screen. That’s the beauty of The Artist. There isn’t a single surprise in its plot, yet it’s one of the season’s most pleasant surprises. There are lots of reasons for that — the audacity of the filmmaker to give his project the silent treatment; marvelous supporting bits by such familiar faces as John Goodman, James Cromwell and Malcolm McDowell; a Jack Russell terrier who deserves a movie all his own; and that almost atomic blast of charm. The Artist may not rank as great art, but I defy you not to have a great time.